"Fyn" redirects here. For other uses, see Fyn (disambiguation). 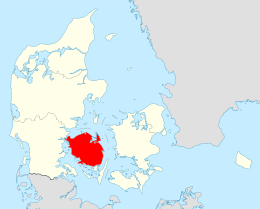 Funen (Danish: Fyn, pronounced [ˈfyːˀn]), with an area of 3,099.7 square kilometres (1,196.8 sq mi), is the third-largest island of Denmark, after Zealand and Vendsyssel-Thy. It is the 165th-largest island in the world. It is located in the central part of the country and has a population of 466,284 (2013). Funen's main city is Odense, which is connected to the sea by a seldom-used canal. The city's shipyard, Odense Steel Shipyard, has been relocated outside Odense proper. Funen is linked to Zealand, Denmark's largest island, by the Great Belt Bridge, which carries both trains and cars. The bridge is in reality three bridges; low road and rail bridges connect Funen to the small island of Sprogø in the middle of the Great Belt, and a long road suspension bridge (the second longest in the world at the time of opening) connects Funen the rest of the way to Zealand, paralleled by a rail tunnel. Apart from the main city, Odense, all major towns are located in coastal areas. Beginning in the north-east of the island and moving clockwise, they are Kerteminde (NE), Nyborg (E), Svendborg (S), Fåborg (SW), Assens (W), Middelfart (NW) and Bogense (N). Funen was the birthplace of Hans Christian Andersen, the composer Carl Nielsen, American Revolutionary War hero Colonel Christian Febiger, pop singer MØ and international footballer Christian Eriksen. Wikimedia Commons has media related to Funen. The Funen Village an open-air museum. Funen brachteate in the collections of the National Museum of Denmark. ^ "Statistikbanken". www.statbank.dk. Retrieved 27 September 2018.